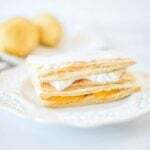 Lemon Curd Napoleons are an easy and simple dessert. Filled with deliciously tangy lemon curd and freshly whipped cream, they are a treat the whole family will enjoy. Do you ever get a hankering for something and it just won’t let up? For the past week I’ve literally been dreaming about lemon curd. That sweet, tart, sticky deliciousness just wouldn’t leave my mind. So I whipped up a batch one afternoon and then needed to figure out how to use it. Being too lazy to go to a store, I rummaged through my freezer and fridge and came up with some frozen puff pastry and whipped cream. And so, these lemon curd & fresh cream napoleons were born! One of my favorite pastries from at home in Ireland is what we call a cream (or custard) slice. They are essentially a napoleon – layers of flaky puff pastry, fresh cream and either jam or custard with a basic icing on top. So delicious! Since lemon curd was the ingredient I needed to work with, I omitted the jam or custard in favor of a layer of lemon goodness. Paired with the fresh cream, it is the perfect spring dessert! The icing on top is simply made my mixing confectioner’s sugar with a few drops of milk. It couldn’t be easier! And while I’m usually a huge advocate for making your own pastry and crusts, puff pastry is the exception since it’s a HUGE process to make. Store bought is so much easier :-) One package of frozen pastry made 4 of these lemon curd Napoleons, but you could make them smaller to stretch the pastry further. I’ve still got some lemon curd left over so I’ll be sharing another simple spring dessert with you next week – Lemon Curd Tartlets. Yum! Bake the puff pastry according to the package instructions. Be sure to prick the sheet of pastry with a fork so that it doesn't puff up too much. They will bake for approximately 10 - 12 minutes. Add sugar to the whipped cream and whisk until peaks begin to form. Once pastry has been removed from oven and allowed to cool, cut into equal size rectangles. Each napoleon will require 3 rectangles. Place the bottom one down, and spread with some of the lemon curd. Place another layer of pastry on top, then spread with the cream. Finally, put the last layer on top. Mix the confectioner's sugar with a few drops of milk until you reach a glaze consistency. You want it to be easily spreadable but not so runny that it runs off the top of the pastry. Glaze each napoleon and allow to chill in the fridge until the glaze has hardened. Using a heavy bottom pan and constantly stirring will help avoid the lemon curd curdling and creating scrambled eggs! Do not be tempted to raise the heat above a medium temperature. Slow and steady is the way to go! These sound amazing! Yay to your ‘laziness’. I am more lazy the other way around, I’d rather go to the store because I can’t be bothered with thawing and I have always forgotten what’s hiding at the bottom of my freezer… And I totally agree, puff pastry is the only exception when it’s okay to buy and not bake yourself. Thanks for the recipe!